You are here: Home / Sides, Salads, Dressings / It’s As Thick As… Pea Soup! I remember when I was growing up if we were eating peas and one of the little suckers got away from us, my mom would joke “You peed on the table.” I do that with my daughter today and we laugh every time. I’ve always wondered if the green peas that you get in frozen bags are the same type of peas that you get dried in the bean section at the store. Maybe they just chop the green ones in half and dry them out? Or are they completely different altogether? One of the great mysteries in life. I love peas and I love soup too. Combine them into a stick in your stomach winter soup and I’m a very happy person. 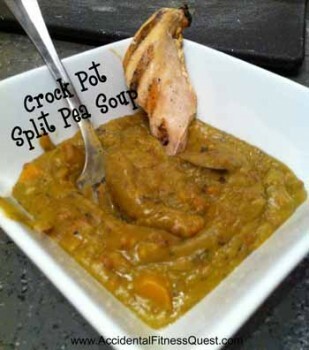 I was excited when Fit and Free Emily posted a recipe for split pea soup using your crock pot. Emily used barley in her version but I decided to use wheat berries instead since I thought that would make for a great combination. Peas like most beans are relatively high in protein so they make a good meat substitute and save you a bit of money too. A huge bag of dried peas was less than a dollar at Walmart, and the soup made 6 servings. You definitely couldn’t buy 6 servings of chicken for a dollar. I’m not hating on chickens and I do eat my fair share of them. Just pointing out the cost difference. 😉 The soup itself has 15g of protein so you can just add a side salad for dinner and be all set. I did add a little bit of grilled chicken breast to mine, and you could also go with the traditional split pea soup choice and add ham. I used more liquid in my version than Emily did and my soup turned out really thick. As in “turn the spoon upside down and it stays on” thick. Personally I LOVE that kind of soup, but you can always add more water to thin it if you like more of a soup consistency. As I ate mine last night, I even pondered using it as a dip. I’ll warn you that the soup looks yuck, but don’t be fooled by its appearance. It’s amazing! Rinse and drain your split peas, making sure any little stones or pebbles are removed. Place all ingredients in a crock pot and stir slightly to combine. Cook on high for 4 – 5 hours or low for 6 – 8 hours. Makes approximately 6 – 1.5 cup servings at 234 calories each. Your serving will be larger for the same calories if you thin it with water. You can see how thick my soup is because it’s holding the ripples in the top and not flat like a wimpy liquid soup would be. It’s got a ton of heart healthy fiber and lots of vitaminy goodness too. What’s your favorite crock pot soup? Do you know if the two types of peas are the same thing? I love wheat berries and I figured they were in the barley ballpark. You definitely need to add the extra water with them since they soak up more, but I love thicker soups in winter. Thank you for the inspiration!